One of the luxuries in life many young people don’t have to worry about is where they’ll rest their head at night. But the harsh reality is, almost 4000 Territorians aged between 12-24 don’t have a stable and safe place to sleep each night, either living in over-crowded accommodation, couch surfing between houses or sleeping rough. More than half of homeless Territorians are under 24 years old. Anglicare NT has a wide range of support services for young people who find themselves without a stable home. They asked one of their clients to share a bit about their situation to illustrate youth homelessness is more than just statistics. Can you share a bit about your experience being homeless in Darwin? I became homeless late last year when my step-dad didn’t let me stay at home with the rest of my family, including my mum and siblings. I also had just found out that I was pregnant which was big and scary news for me. I felt terrible and helpless when he kicked me out and instead of being able to be overcome with joy in having a baby I was overcome with unhappiness. It was a really tough time for me. What are some of the challenges you've faced and how have you overcome them? My main challenge since getting kicked out of my family home has been feeling isolated from my mum and siblings and having to sneak around to see them. It’s been hard to be pregnant and not have my mum close by and friends treat me differently because they think I can’t do fun things anymore. Feeling lonely has been, and still is, a big challenge for me. I have overcome these challenges by thinking about how other people have had strength to overcome similar if not worse things. I have realised that there’s no point sitting around being sad and I have to accept the reality and be positive. I look forward to the happy times where I get to see my family and spend time with friends and do stuff. What would you like people to know about young people in your situation? I would want people to know that I didn’t have a choice in my situation; it’s tough to not know where you are going to live. Every day I wish this didn’t happen to me but you have to just deal with it. I think people should know that it’s important to ask for help when you’re in a tough situation; either ask for help from services or family and friends. I’m lucky that I have supports around me. How has Anglicare NT helped you? Anglicare NT has helped me a lot; they have given me a place to live when I really needed it. The workers check in on me to see how I’m going. They’ve given me new experiences like inviting me to Parliament House for International Women’s Day where I met and spoke with Chief Minister Michael Gunner and lots of other interesting people – it really meant a lot to me. I’m also part of the Pandanus Child Birth Education Program through Anglicare NT. It’s a really good program because I get to learn more about pregnancy and what to expect when my baby is born. I’ve also met lots of other young pregnant women. For the past six years Anglicare and the City of Darwin have held a couch surfing race to raise public awareness of the extent and impact of the issue, and to celebrate the resilience of the young people affected. 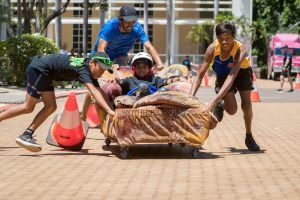 The annual race, which sees old couches transformed into speed-lounges on wheels, is often a highlight on the Youth Week calendar on Youth Homelessness Matters Day.